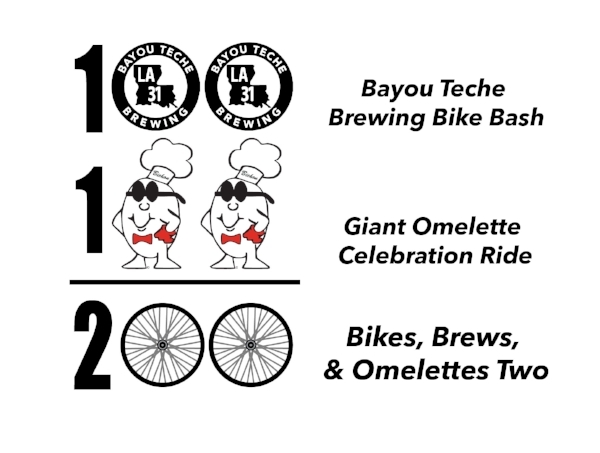 Back-to-back bike rides, The Bayou Teche Brewing Bike Bash and The Giant Omelette Celebration Ride, combined under one name to form one great weekend of craft beer, live music, a GIANT omelette, and 200 miles of the best cycling Acadiana has to offer. Day of registration is available on site. Beautiful routes with freshly paved roads and freshly brewed beer from our friends at Bayou Teche Brewery in Arnaudville. Post ride party includes some of the greatest beers poured by the brew master (probably wearing white shrimp boots), live music and plenty of food. Visit Arnaudville and ride on some of the smoothest roads in LA. Distances options are: 10 to 100 miles with many in between. After the ride enjoy the party at Bayou Teche Brewery with live music, brewery tours, great beers and plenty of food. 7:50 am: Start time for 100 mile group and anyone who wants to start early. 11:00 pm - 2:00 pm: Music at Bayou Teche! 3:00 pm - 6:00 pm: Stick around for an incredible night at Bayou Teche Brewing! -Techeticles Extra Brut IPA Release Party! Zero Gravity! 4 packs! The ride offers distances of 10 to 100 miles with many in between. A highlight of the longer ride is crossing the Intracoastal Bridge in Forked Island then grabbing some boudin from Stelly's Grocery, one of your SAG stations on the ride. This ride is generally flat and will take you South to the coastal marshes. The roads are nice and many were repaved after hurricane Rita. The ride starts and finish at the Vermilion Parish Courthouse (100 North State St., Abbeville, LA 70510). You will finish the bike ride in time to see the procession of the chefs as the prepare a 12 foot diameter skillet and cook an omelette with over 5,000 eggs. 7:00 am: Start time for 100 & 87 & 82 mile groups and anyone who wants to start early. 10:00 am - 2:00 pm: Food and beverages for riders provided by Cafe 20.3 on the Bayou. 9:00 am - 4:30 pm: Giant Omelette Celebration with music by Richard LeBouef and Two Step and Fa Tras Local Cajun Band. THE GIANT OMELETTE CELEBRATION is a unique (only 8 in the world) French based festival, and Abbeville hosts the only one in the US. According to legend, when Napoleon and his army were traveling through the south of France, they decided to rest for the night near the town of Bessieres. Napoleon feasted on an omelette prepared by a local innkeeper which was such a culinary delight that he ordered the townspeople to gather all the eggs in the village and to prepare a huge omelette for his army the next day. From this beginning, the omelette became a tradition to feed the poor of the village at Easter. It has also become the symbol of a world-wide fraternity, rich in friendship, tradition and cultural exchange, known as the Confrerie. Our routes are all available on Ride With GPS. You can also join our RWGPS club to download the routes to have access while you're riding. Click here to join the club. These routes are from the 2017 ride and may change for 2018. The general locations and distances will be the same. No bike? No Problem! TRAIL has the largest fleet of rental bicycles in Acadiana. These bikes are ideally suited to ride long distances on Louisiana roads. They are comfortable, fast, well-equipped, and well-maintained. Our rental bikes are available for as low as $20 for the weekend with registration. Plus the bike will be delivered to you for the start of the ride and then drop it off at the end. Whether you are trying to avoid the cost of traveling with your bike or you are looking to upgrade to a performance road bike then TRAIL will have the right bike for you.